MASACRE was born in Medellín in 1998 during a period of violence, political corruption, drug wars and death. This hostile environment was reflected in their lyrics which generated immediate following and fans recognition. Their demo “Colombia… Imperio del Terror” was released in 1989 and “Cáncer de Nuestros días” in 1990, both with a raw and rough sound and a DIY method. By 1990 the band released a 10” MaxiEP with 3 songs, “Ola de Violencia” became a huge underground success worldwide as the sound was improved while keeping the aggressive essence. French label Osmose Productions offered them a deal to release the album “Reqviem” in 1991. Masacre gained worldwide recognition being showcased on several magazines and toured in South America. In 1992 Osmose released the “Ola de Violencia” split with the band Profanatica. 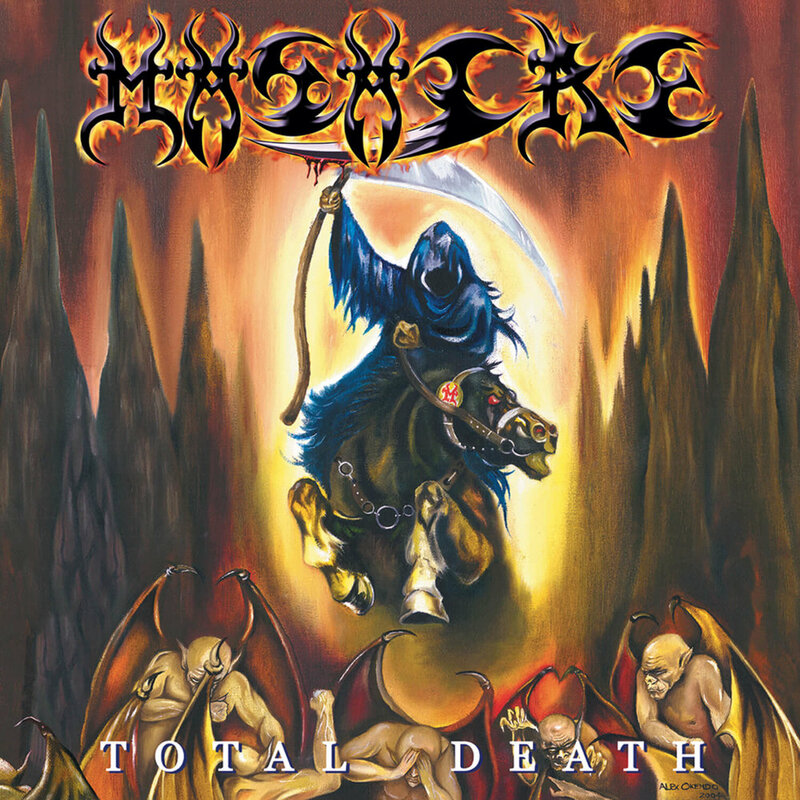 In 1993 Masacre went back to studio to record four songs exploring a more dense, deep and doomish direction, and released the 10” MaxiEP “Barbarie y Sangre en Memoria de Cristo” in the band own label Morbida Productions. In 1996 the label Lorito Records released Masacre’s second full length “Sacro”, showing a return to their Death Metal path; they promoted and tour the album in South America. For the next few years the band focused on live performances while some of their previous material was included in compilations by international labels. In 2001 Masacre and Decade Records (now HateWorks) signed a deal to release two new albums, “Muerte Verdadera Muerte” (2001) marked a triumphant return to the band, generating excellent reviews from international media outlets and great response from fans worldwide. The album was licensed in Spain and Argentina, as well as releases on tape and vinyl. HateWorks released for the first time on CD “Barbarie y Sangre en Memoria de Cristo” in 2003, meanwhile the band started production work for “Total Death” with Erik Rutan. The album was relased also by HateWorks in 2004 and it’s considered by many their best album yet. The promotional tour ended up being the longest for Masacre and included 13 dates in Europe. In 2006 HateWorks produced the first tribute album to masacre featuring 14 bands from South America. To commemorate the band’s 20th anniversary in 2008, the DVD “20 Years of Death” was released including a full live performance, a documentary and tour footage. The following year japanese label Obliteration Records released “Sacro” and both demos on CD format. In 2012 Masacre played a 8 date tour in Mexico and recorded three songs from their debut album “Reqviem” to be released later on vinyl by Non Servian Records. Also that year American Line Prods from Mexico re-released their first demo on vinyl and Nuclear War Now from US released both their MaxiEP’s. In 2013 Masacre focus their efforts in the production of their 5th album “Brutal Aggression” to be released in 2014 under the band’s label Morbida Prods. The same year they played their first shows in US and in 2015 received an invitation to play at 70000 Tons of Metal Cruise, received the Cripper Award as well as performing at Maryland Death Fest. In 2017 two live shows from the early 90’s were released on CD, “Evil Death Live” from ’91 by Peruvian label Demonic War Cult and “Legendeath” ’92 by Colombian Psychophony Records. 30 years later Masacre are still the gods of Colombian Total Brutal Death Metal and a living legend of south american underground, celebrating with an anniversary tour, the re-release of the album “Sacro” on vinyl by argentinian Disembodied Records and preparing their upcoming recording.